At SELECTBIO’s recent Food Safety & Analysis Congress in Cambridge, the latest developments in food analysis technologies were presented. We spoke to Andrew James, Marketing Director at Ellutia, to find out more about Ellutia, some of the chromatography solutions they offer, and how these can benefit those working in the food analysis field. AM: Can you tell us a little about Ellutia and its history over the last 22 years? AJ: Ellutia design and produce a range of gas chromatographs, GC accessories, software, and consumables. Our main focus is to supply complete solutions to analytical problems, therefore, our systems are designed to be smaller, faster, give greater sensitivity and be more energy efficient. We collaborate closely with our customers to produce, install and support customised systems to fit their exact requirements. Over the last 22 years, we began as Cambridge Scientific Instruments in the UK and then joined together with sister companies from the USA to create the global chromatography solutions brand Ellutia. We all worked together closely to design and produce an innovative range of gas chromatography instruments to deliver more consistent, higher quality services and products around the world. We are headquartered in the UK but also have regional offices in the USA and Germany as well as distributors around the world. AM: One of Ellutia’s flagship offerings is the 200 Series Gas Chromatograph. Can you describe the heat exchange technology it uses, and the benefits this provides? AJ: Our 200 Series Gas Chromatograph has patented flow through technology, and is now well established at providing excellent chromatographic performance and reliability. Flame ionisation, flame photometric, thermal conductivity and electron capture detectors can cover most of the analytical applications in industry today. The main principle of the heat exchange technology used in the 200 Series Gas Chromatograph is the inclusion of a flow through oven and a heat exchanger unit. Ambient air is drawn in and passed through a heater, this circulates in the column oven compartment, the hot air is then passed back out via a heat exchanger system which transfers heat from the out going air to the air being drawn in. The main benefit of this is that the heat energy is retained in the system, meaning we don’t need to use as much power to heat the incoming air to the desired temperature. This allows us to use smaller heaters making the instrument smaller and more compact whilst reducing the power required to operate the instrument. AM: Can you tell us more about the issue of residual solvents in printed packaging? AJ: In printing most inks used are solvent-based, resulting in a printed substrate that will always contain a certain amount of residual solvents and these chemicals can influence the sensory properties of the packed product. Almost all of the packaging materials contain printings that could come into contact with foodstuffs. The most commonly used ink solvents, including alcohols, ethers, acetates and other petrochemicals, have all been linked to various types of ill-health. Our human senses, in particular our sense of smell and taste are sensitive enough to detect very small amounts of residual solvents. Many items can contain residual solvents, from manufacturers’ packaging to crockery and cutlery, glassware, ceramics and storage containers and these should all be tested to ensure they are safe for use and do not exceed any required limits. AM: What are some of the challenges of residual solvent testing, and how can the 200 Series GC help in this field? AJ: Residual solvents are often not completely removed from the manufacturing processes utilised to produce finished products, therefore, some level of residual solvents may be present and their presence has to be measured and justified. The 200 series GC can cover most of the analytical applications in industry today including that of residual solvent analysis. Figure 1 below shows the application carried out on a 10 µl volume of a printing ink. 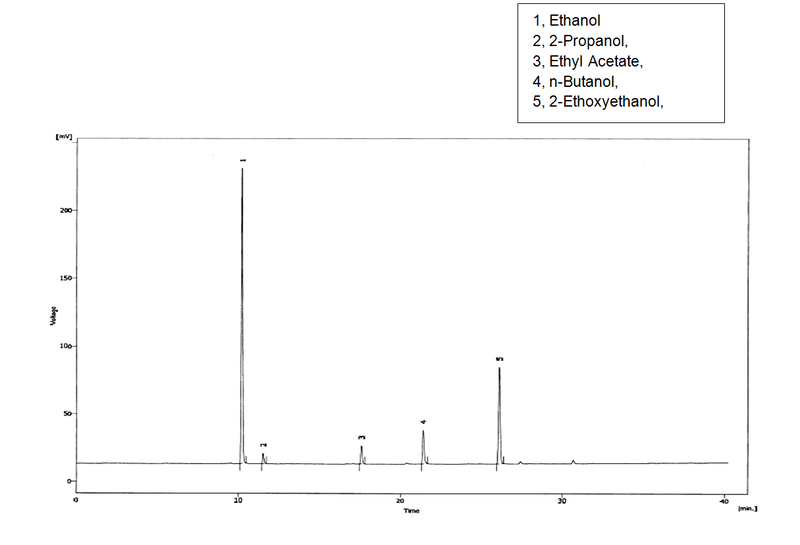 The results of this analysis reported as 60% Ethanol, 2% 2-Propanol, 4% Ethyl Acetate, 9% n-Butanol and 25% 2-Ethoxyethanol. Figure 1: 0.5 ml Headspace injection of a yellow printing ink used for plastic film packaging. Andrew James is Marketing Director at Ellutia. Andrew has worked at Ellutia for over 20 years, during this time he has been involved with many aspects of the business from product development to strategic planning. This wide range involvement has developed an extensive wealth of knowledge and experience in the chromatography industry. Andrew has been in charge of the company’s marketing for the last 8 years, working to continually grow both the Ellutia brand and company as a whole. Andrew James was speaking to Anna MacDonald, Editor for Technology Networks.